Two current Terriers and a pair of incoming freshman are among the 120 draft-eligible players who will attend the NHL Combine in Buffalo beginning tomorrow. Freshmen Jack Eichel and AJ Greer (photo) were ranked #2 and #69 respectively in the final NHL Central Scouting draft rankings, while 2015 recruits Jakob Forsbacka-Karlsson and Jordan Greenway were ranked #31 and #47 respectively. College Hockey Inc. reports that 25 of the combine invitees are current or future college players. On Thursday night, Eichel officially received the 2015 Hobey Baker Memorial Award at the Baker Foundation’s annual awards dinner in St. Paul. 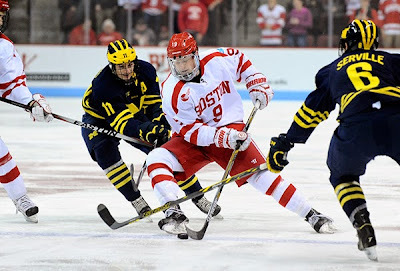 Eichel is the 34th recipient of the award given to the top NCAA hockey playing and the third Terrier to be honored with it. Chris Drury won the award in 1998 after having been a finalist the previous year. Matt Gilroy won the award in 2009, culminating a season in which he led BU to the national championship. Gilroy was among a group of past winners who attended the banquet. From left: former BU captain Chris Connolly, former BU goalie Peter Fish, Coach Jack Parker, Jack Eichel, Coach David Quinn, and former BU forward Peter Donatelli, and former BU captain and Hobey Baker Award winner Matt Gilroy. 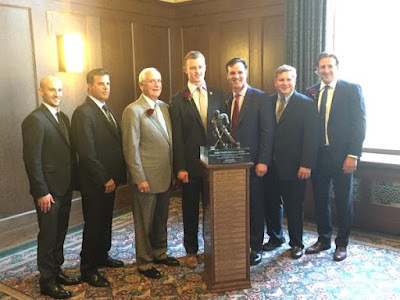 During the banquet, former Coach Jack Parker delivered a tribute to the late Yale coach Tim Taylor, who was named a Hobey Legend of Hockey, the honor bestowed upon Parker a year ago. ►NHL.com’s Mike Morreale offered up a comparison of Eichel and former Maine star Paul Kariya, the only other freshman to win the Hobey Baker Award. ►Recently hired Sabres coach Dan Bylsma talked with WGR Radio about Eichel whom he’d recently coached during the IIHF World Championships in which Team USA took home a bronze medal and Eichel was the team’s third leading scorer. Meanwhile, Terrier Associate Head Coach Steve Greeley told WGRZ-TV in Buffalo that the freshman forward who led Division 1 in scoring with 71 points, is ready to make the jump to the NHL. Three future Terriers were named to All-USHL teams. 2015 recruit Maxim Letunov (photo), who scored 64 points (25G, 39A) for Youngstown, was named to the second team. 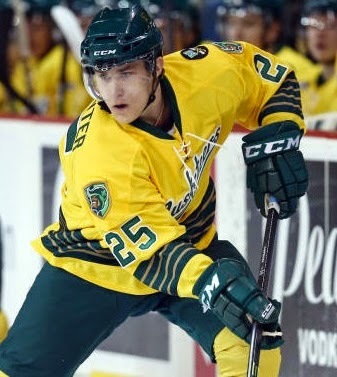 Drafted in the second round of the 2014 NHL draft by St. Louis, the Moscow native’s rights were traded to Arizona this season. 2015 recruit Jakob Forsbacka-Karlsson and 2016 recruit Kieffer Bellows were named to the third team. Forsbacka-Karlsson, a playmaking center from Sweden, tallied 53 points (15G, 38A) in 50 games for Omaha. Bellows, who had previously been named the USHL’s Rookie of the Year, set a USHL Tier 1 era record for goals by a 16-year-old with 33. That production helped Sioux Falls capture the league’s Clark Cup championship. The Toronto Sun noted that former Terrier wing John Hynes is a candidate for the vacant New Jersey Devil head coaching job. 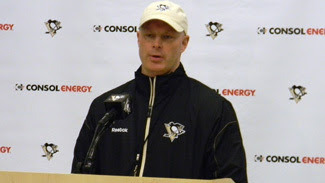 A member of BU's 1995 national championship team, Hynes has been head coach of the Penguins' AHL club in Wilkes Barre/Scranton for the past five seasons. UPDATE: TSN's Bob McKenzie reporting that Hynes appears to be the front-runner. New Devils GM Ray Shero knows Hynes well from his days running the Penguins' organization. 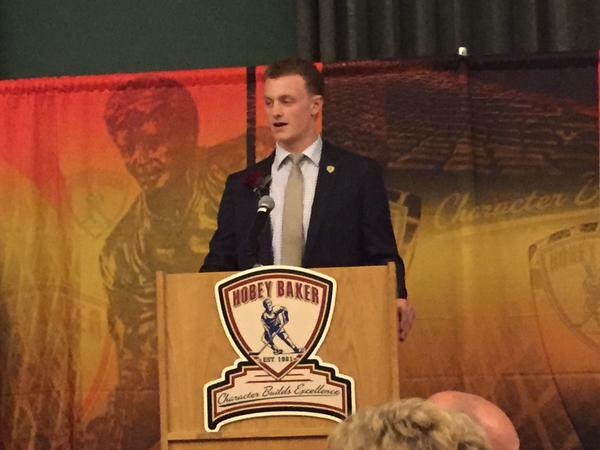 Jack Eichel added one more honor to the list of awards recognizing his standout freshman season at BU. USA Hockey named Eichel its College Player of the Year. 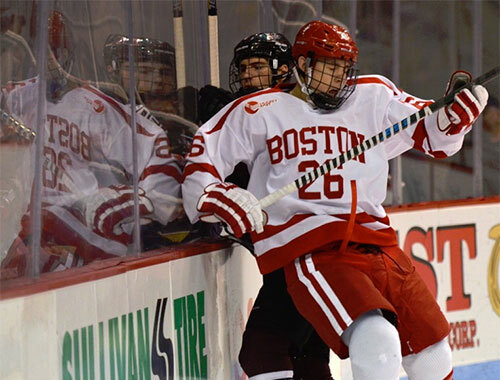 The 6-2 center from North Chelmsford led all Division 1 players in points (71), assists (45) and plus-minus (+51) pacing the Terriers to the Beanpot Championship, Hockey East regular-season and tournament championships and the NCAA title game. After the BU season, the 2015 Hobey Baker Award winner joined Team USA for the IIHF World Championships and helped the squad take home a bronze medal. 2016 recruit Kieffer Bellows was named USHL Rookie of the Year and earned a spot on the league's all-rookie team. The Edina, Minn., native scored 33 regular-season goals for Sioux Falls and another nine during the Stampede's run to the Clark Cup Championship. Bellows scored the game-winner in the series-clinching win against Tri-City. 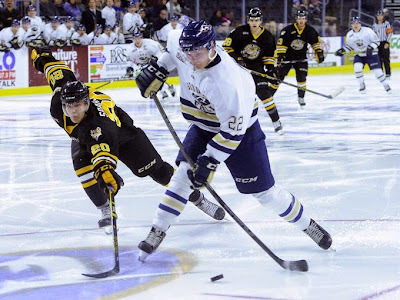 2015 recruit Robert Carpenter was named to the USHL 2nd all-rookie team. The right-shot center from North Reading, Mass., tied for the league lead in goals with 35 and added 28 assists for Sioux City. Anthony Morando, whose goal as Terrier Strength and Conditioning coach was to "make sure nobody outworks us," is leaving the program and moving to North Dakota with his fiancée, Monique Lamoreaux, a member of the U.S. National Women's Team that won a gold medal in the 2015 World Championships. Last summer, Morando talked with THFB about his approach to strength and conditioning. With the 2015 NHL draft combine set to begin on June 1 in Buffalo, several current and incoming Terriers are expected to participate in advance of the NHL Entry Draft on June 26 and 27 in Sunrise, Fla. Pre-draft profiles —most with video—are now appearing online. Former Terrier forward Ryan Weston will be inducted next fall into the New Hampshire Legends of Hockey Hall of Fame. A native of Henniker, Weston played four seasons at BU, including as a member of the 2006 Hockey East championship squad, before spending four seasons in the minor leagues. He is currently head coach of the San Diego State Aztecs, an ACHA Division 2 team. Also being inducted to the NHLHHF is former Terrier Russ Bartlett, who played two seasons in Scarlet before transferring to St. Lawrence. He’s best remembered for scoring the overtime game-winner in BU’s 3-2 win over BC in the 1999 Beanpot semifinal. 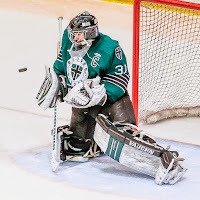 BU has added what may be the final piece of its 2015 recruit class by securing a commitment from 6-3, 165 lb., goalie Max Prawdzik, who led The Brooks School to the New England Prep Large School championship, posting a gaudy 1.25 GAA and a .944 save percentage. The Andover, Mass., native, who served as team captain, also authored eight shutouts, en route to being named ISL Hockey League MVP honors. Prawdzik, who stopped 26 shots in the Bishops’ 4-2 NEPSAC Large School title game win against Belmont Hill, earned All New England Prep All-Star honors and was named a Boston Globe Prep All-Scholastic. In 2013, he led Brooks to the ISL Eberhart championship and the NE Prep Small School Tournament Championship. A 2012 invitee to the USA Hockey Strelow National Goaltending Camp and a 2013 draftee of the USHL Tri-City Storm, Prawdzik also played for the Neponset Valley River Rats 18Us, teaming with 2017 recruit Patrick Harper. Max is a poised, competitive mentally tough kid. He's still raw...he has a lot of potential. Max was a big reason we won the Large School Championship this season. He's got great technique, moves pretty well and can handle the puck to start a breakout. Max needs to put on some muscle, add some explosiveness and adjust to the caliber of Hockey East. I'm excited for him for earning this opportunity and definitely think his best hockey is ahead of him. According to SB Nation’s Jeff Cox, Vermont was among several schools recruiting Prawdzik, who had originally planned to play in the BCHL next season for Trail. Following the win over Belmont Hill, Cox noted: He's the prototypical modern era goaltender with good size and plays well in the butterfly. He's got a quick lower body and made a few nice pad saves on Sunday." 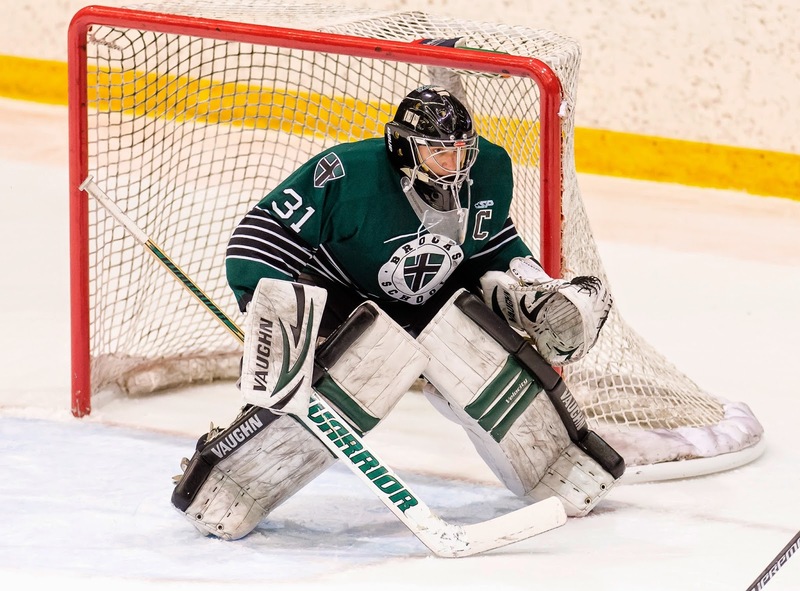 97 G Max Prawdzik (@BrooksHockey) commits to BU. Huge, athletic stopper was one of the best goalies in prep, very tough to solve in the ISL. A trio of Terriers led Team USA to the bronze medal at the IIHF World Championship with a 3-0 shutout of the host team, the Czech Republic, on Sunday. Vancouver forward Nick Bonino scored the game’s first goal midway through the opening period. Then with 1:42 left, Jack Eichel protected the puck along with boards, wheeled and threaded a pass to Trevor Lewis on the doorstep for an easy redirect into the net. In the third period, Bonino took a pass from Charlie Coyle and returned it to the Minnesota Wild wing in the high slot for a one-timer that found net. Coyle also had a two-point game, having assisted on Bonino’s first-period goal. Eichel finished the tournament with seven points, third best among US skaters. Bonino and Coyle, who joined the team after their NHL teams were eliminated from the playoffs, had 4 points and 5 points respectively. Team USA also won a bronze in the 2013 World Championships with former Terrier Joe Sacco as head coach. The last time a US team medaled with Terriers on the roster was 2004 with Chris Drury and Mike Grier; the previous time was 1949 when BU was represented by Dan Crowley and Jack Kelley, who later became a Hall of Fame Terrier coach.